Be the first to share your favorite memory, photo or story of Edgar "Ed". This memorial page is dedicated for family, friends and future generations to celebrate the life of their loved one. 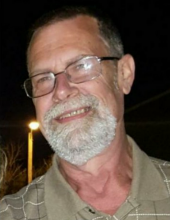 Edgar ‘Ed’ C. Welsh III, 61, of Peoria, IL passed away March 31st at UnityPoint Hospital. He was born on November 6, 1957 in Decatur, IL to Virginia and Edgar C. Welsh Jr. He married Sandra K. Adamson on April 28, 1979 in Peoria. Surviving are his wife; two daughters Amanda of Chicago, Lee of Peoria; one son Richard of Peoria; his favorite grandson Connor, and his beloved dog Yoda. He was proceeded in death by his parents. After graduating from Peoria High School, Ed served in the Navy from 1975-1985, on the USS Davidson in Hawaii, the USS Kiska in California, and the USS Iowa in Mississippi. He had the honor of participating on the recommission of the USS Iowa. He worked for the Department of Treasury at the IRS in Bloomington, IL and he retired from there is 2004. He worked at the Caterpillar Mossville plant before working as the Maintenance Supervisor at the Federal Court House until the time of his death. Ed loved spending time with his family, especially with the love of his life, Sandy of over 40 years. He enjoyed going to his family cabin and taking roadtrips to go antique hunting and to auctions with Sandy. Hanging out with his kids and his grandson was his favorite past-time. His family meant everything to him. He had a great love for animals, cheesy movies on the SyFy channel (Sharknado was his favorite), an intense sweet tooth, and a constant craving for Diet Coke. He left love notes to Sandy all over the place and his laughter was infectious. Ed was selfless, loving, and a source of quiet strength to so many. A celebration of life is planned for Sunday, April 7th from 1pm-4pm at the Itoo Hall at 4904 W. Farmington Rd, Peoria IL 60614. Cremation rites will be accorded and, per his wishes, his ashes are going back to his family cabin. In lieu of flowers, memorials may be made to the Exotic Feline Rescue Center at 2221 E. Ashboro Rd, Center Point, IN 47840. To send flowers or a remembrance gift to the family of Edgar "Ed" C. Welsh III, please visit our Tribute Store. "Email Address" would like to share the life celebration of Edgar "Ed" C. Welsh III. Click on the "link" to go to share a favorite memory or leave a condolence message for the family.